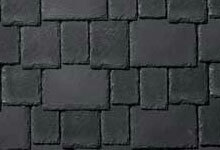 Lamarite Slate Composite Shingles by TAMKO offer homeowners the authentic look of a classic slate roof without the high-cost and performance issues. 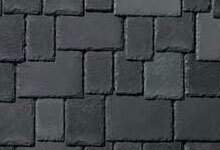 Lamarite Slate Composite Shingles are made of innovative composite materials that are robust, fire resistant, and enduring. 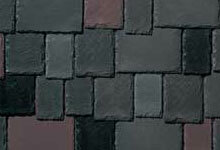 Lamarite shingles are formed to the specific textures and contours of slate to create authentic dimension and beauty. 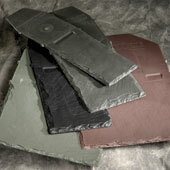 They're lighter in weight, and more resistant against cracking under inclement weather or heavy foot traffic. They also require less maintenance. Patent Pending. Choose the color that best compliments your home or create your own unique color combination by mixing in an occasional accent color. Natural Beauty. The Performance of Lamarite. 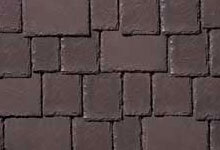 Easier application than slate–lighter in weight, easier to cut, and is attached using a pneumatic nail gun and two corrosion-resistant roofing nails per shingle. Still prefer to hand nail? 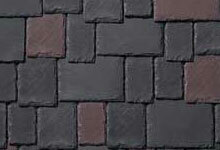 With Lamarite shingles you have that choice. You can nail them by hand using two corrosion resistant roofing nails. 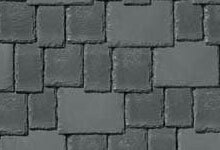 Shade variation has been designed into the production process for Lamarite Slate shingles to provide a more realistic random appearance found in nature. 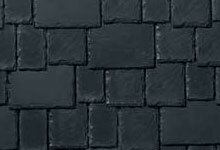 Our application instructions take advantage of that quality to help create the natural beauty of a slate roof and reduce the effects of fading experienced by all roofing products. Note: Representation of these colors is as accurate as modern technology will permit. 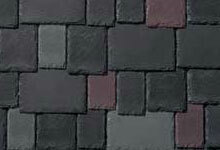 TAMKO recommends viewing an actual roof installation or several full-size shingles prior to final color selection for the full impact of color blending and patterns.